Twenty floors above sea level sits the Crown, The Residency Towers' rooftop restaurant. It's a 60-seat restaurant and adjoining it is an alfresco deck that can seat another 60. The view of the city from here is worth a trip to the hotel. 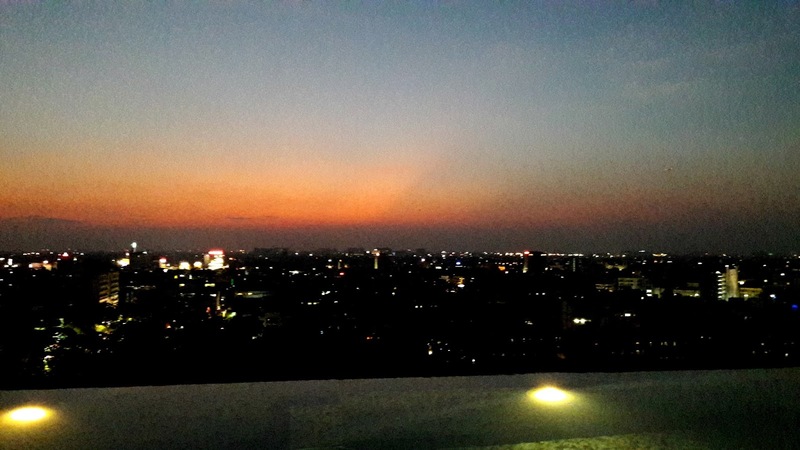 The restaurant opens at 6.30 in the evening and the sight of the sun setting in the west amidst the twinkling of the city lights is stunning - the perfect setting for a Sundowner. 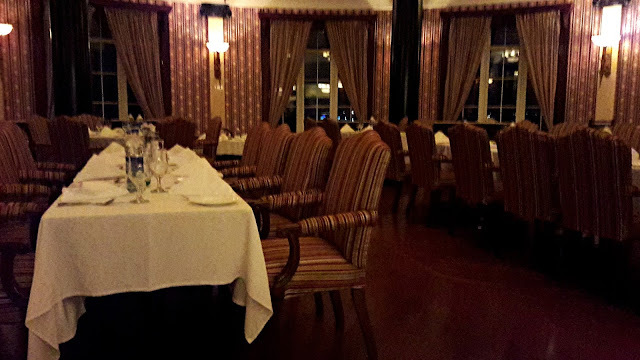 Walking into the restaurant, you'd think you've walked into a wealthy aunt's dining room, except that there are more tables here. The room is circular, drapes on long windows are pulled back and fastened but you can still see the evening sky through them. Tables are covered with crisp white tablecloths and set with dinnerware, striped upholstery of the chairs are in muted shades of brown and cream and the lighting is dim. In the centre of the ceiling is a cupola with a beautiful chandelier. Very elegant, very stylish, very welcoming. 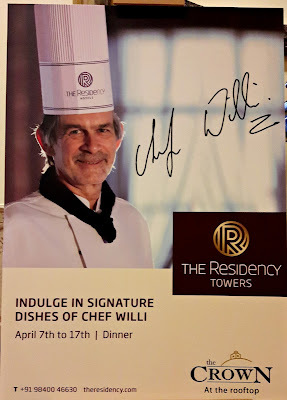 The invite was for the launch of Chef Willi's signature dishes at the restaurant. For unknown reasons, we didn't get to try out those specialties that day but I did get to chat with the chef for a few minutes. We talked about New Zealand, Chennai, kitchens and of course, food. A week later, I was back at the Crown. This time, my friend and I were going to try out those promised signature dishes, at least, some of them. 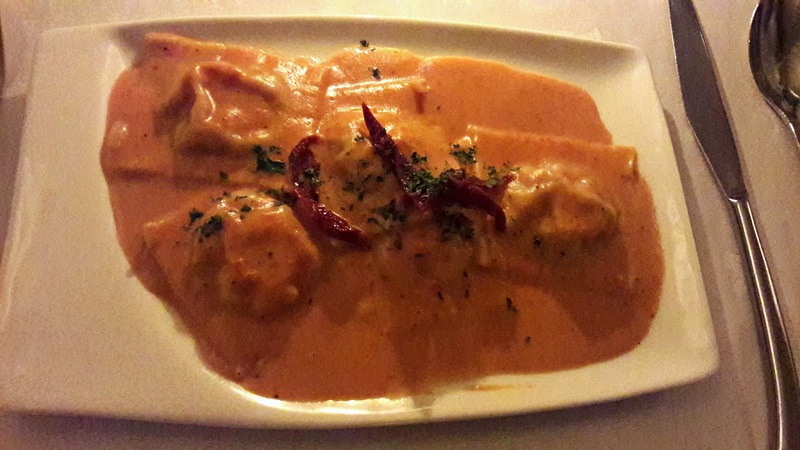 The menu has plenty of variety, even for the vegetarians and has a distinct European flavour. We sat out on the deck for some time and then retreated into the cooler confines of the restaurant though other patrons seemed to enjoy the great outdoors. Deliciously soft breads were served at the table, I wish a dip had been served with them rather than butter chiplets. The lime mint cooler I ordered was perfect for the weather, bits of ginger cut down on the sweetness and made it even more refreshing. 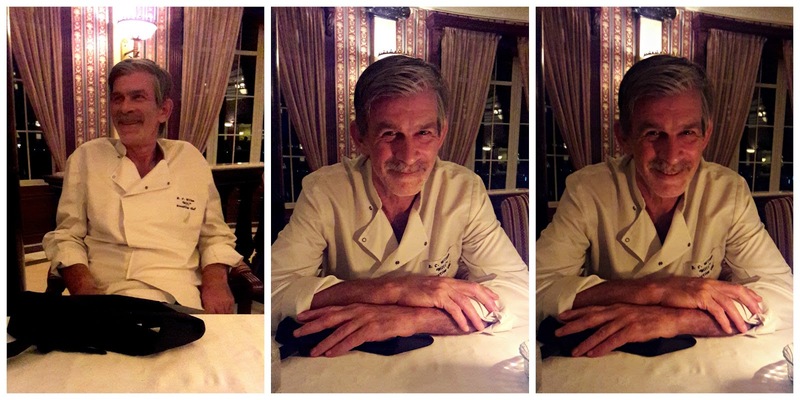 Don't ask Chef Willi what he would recommend for your appetiser and main courses - he says he'd probably have to cut off your tongue to see what your taste buds are like (!!) (no no, he wasn't serious!!) but he did hint I should try the Calamari in Tomato Butter. Certainly a good hint. 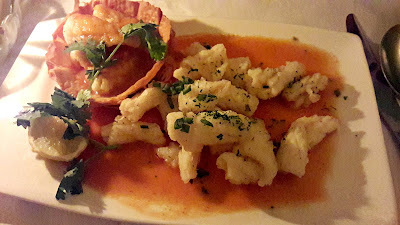 Batter fried crisp calamari that looked like pillowy clouds sat on a deliciously light and tangy tomato butter sauce. 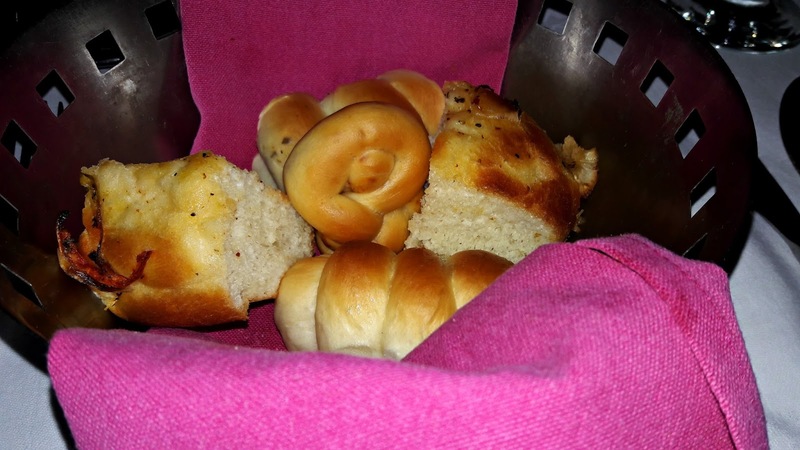 A phyllo pastry cup, crunchy and full of the delicious goodness of butter and with more calamari and sauce in it added a whimsical touch to the presentation. The calamari had been cooked just right and was tender. My friend had ordered Pasta Squares with Smoked Chicken. Creamy sun dried tomato sauce drenched the pasta, the smoked chicken filling was really good though the pasta was quite doughy. For mains, it was a toss up between Smoked Chicken Cannelloni and Open Chicken Lasagne. Cannelloni won. We also ordered Breaded Fish Fillets and Braised Lamb Shanks which was highly recommended. 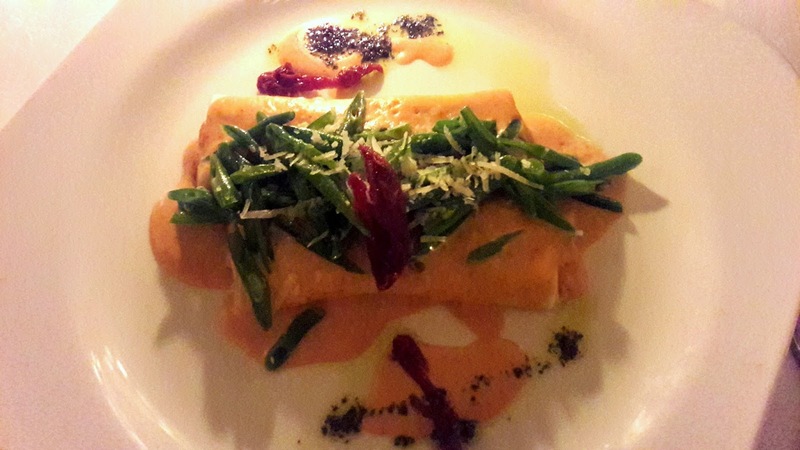 The cannelloni came topped with finely sliced beans. I do like my greens but these were a tad underdone but a total contrast to the extremely well made cannelloni. 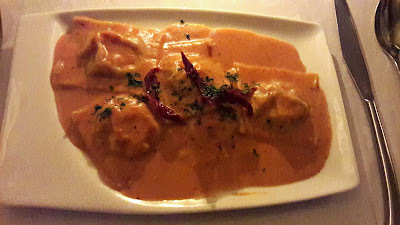 The filling was creamy and dreamy, the smokiness of the chicken providing a beautiful contrast to the subtle sun dried tomato and cream sauce. 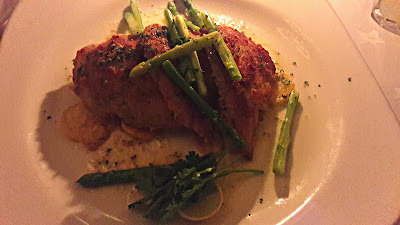 Coated with breadcrumbs, herbs and Parmesan cheese, the pan fried fish fillets were served with a light butter herb sauce and decorated with asparagus spears. I could hear my friend crunching through the potato crisps, a nice change from the usual fries. 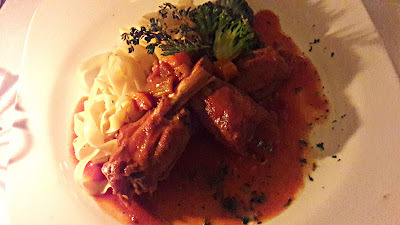 The lamb shanks, braised to tenderness in a red wine sauce had the meat almost falling off the bone. Diced carrots added their sweetness to the amalgamation of flavours and there was a serving of ribbon pasta as well to twirl through all that delicious sauce. Stuffed to the gills, we were told not to miss their desserts. 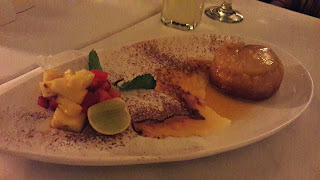 Five desserts are on offer and we chose Pineapple upside down cake and Tiramisu. The pineapple cake was served warm, dipping forkfuls of the vanilla scented cake in that delicious syrup was extremely satisfying. I seem to be on a mission to find out places where the best tiramisu is served in Chennai. 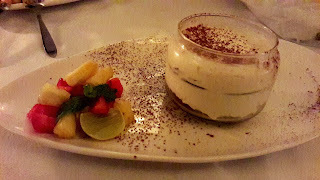 Happy to report that the Crown has got it almost perfect - almost - because for me, it's not tiramisu unless it is layered with savoiardi biscuits, modern interpretations notwithstanding. Signature Dishes of Chef Willi is on till 17th April only for dinner at the Crown, The Residency Towers. Call 044 2815 6363 for reservations.